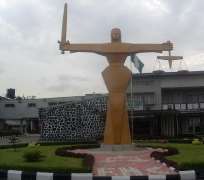 Justice Lateefat Okunnu of a Lagos High Court, Ikeja, on Wednesday discharged the bench warrant issued against two oil marketers, Opeyemi Ajuyah and Olarenwaju Olalusi. The warrant for the arrest of the oil marketers was issued on Tuesday following their failure to appear in court without good reasons. At the resumed trial on Wednesday, the defendants appeared in court, accompanied by their counsel. The development made Justice Okunnu to discharge the warrant for their arrest. Ajuyah and Olalusi are standing trial over alleged N1.1 billion fuel subsidy fraud. They were charged alongside Abdullahi Alao, son of prominent businessman, Alhaji Abdullazeez Arisekola-Alao by the Economic and Financial Crimes Commission (EFCC). They are facing an eight-count charge bordering on conspiracy, obtaining money by false pretences, forgery, uttering and use of false documents. Counsel to the defendants, Dr. Joseph Nwobike (SAN) and Mr. Oludare Falana apologised for their absence in court the previous day. They told the court that their clients were not aware that the date had been set aside for the proceedings. The lawyers had prayed the court to discharge the arrest warrant issued against the two defendants. Counsel to the EFCC, Mr. Ben Obi, did not oppose the oral application to vacate the warrant. The judge said that Alao's counsel, Mr. Aderemi Oguntoye, ought to have informed the other defendants that the date had been fixed for the hearing of the application.